I honestly can't get over the amount of views the first part of this series got and I'm so glad people were interested and enjoyed it, so here is the second part of the series my night/event makeup bag. If you missed the first post ft. my everyday makeup you can find it here! Night time/ Event makeup is probably my favourite to do because you get to go all out and it's totally acceptable! If you may of thought that my everyday makeup was heavy my night/event makeup is double the amount even though it doesn't seem it product wise in the photos but everything is heavier and darker normally. 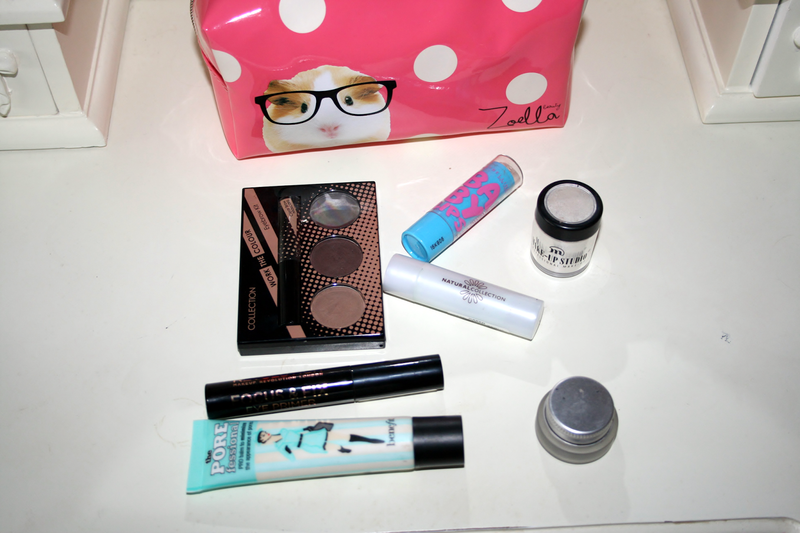 Again you'll find my must haves green neutralizer, the porefessional and gel liner. Foundation wise when it's a night out or an event I prefer wearing liquid foundation even though I don't love it so much right now. At the moment I'm using both Wake me up in 'Light Porcelain' and Match perfection in 'Classic Ivory'. I don't fake tan a lot or ever to be honest so Im always pale 98% of the time. With liquid foundations I always use the Makeup Studio translucent powder just because I feel it works better with liquids and rarely needs to be touched up. I'll normally use my Makeup Revolution concealer palette as because it has so many shades I can conceal any blemishes, highlight and brighten under my eyes so it's handy instead of having 4 different tubes of concealer. 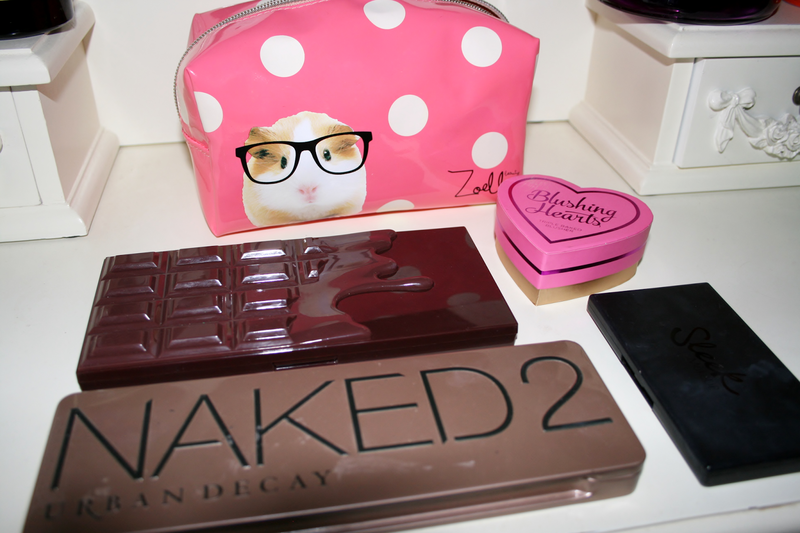 Naked 2 is always an essential the colours are just perfect and I now always have the I Heart Chocolate palette with me aswell, again by Makeup Rev. Blusher changes all the time depending on what kind of colour I want. I always have a gloss, balm, lipstick, liquid lipstick and lipliner because I never really know what I'm going to put on my lips until the last minute so this way I have a small choice. The ones in this weeks one were Tanya Burr lipgloss in Picnic in the Park, Mac lipstick in Hearts Aflame, Makeup studio red lipliner, Apocalips in Luna and Babylips in Hydrate. Sleek face form, Collection brow kit, Focus and fix eye primer, Makeup studio in Rose Quartz, False lashes, They're Real mascara and a kohl liner. 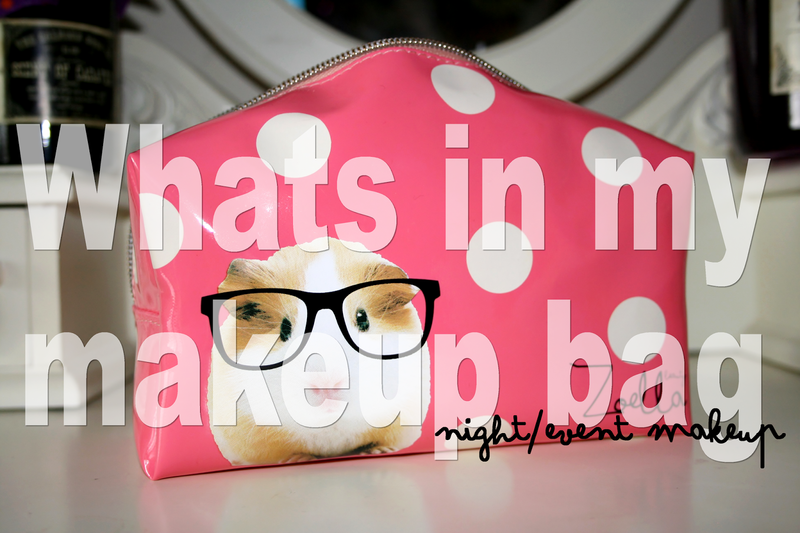 Whats in your makeup bag for night/event makeup? Such a cute makeup bag! I love your collection of foundations! I really need to try out the Urban Decay naked palettes! Very cute make up bag. 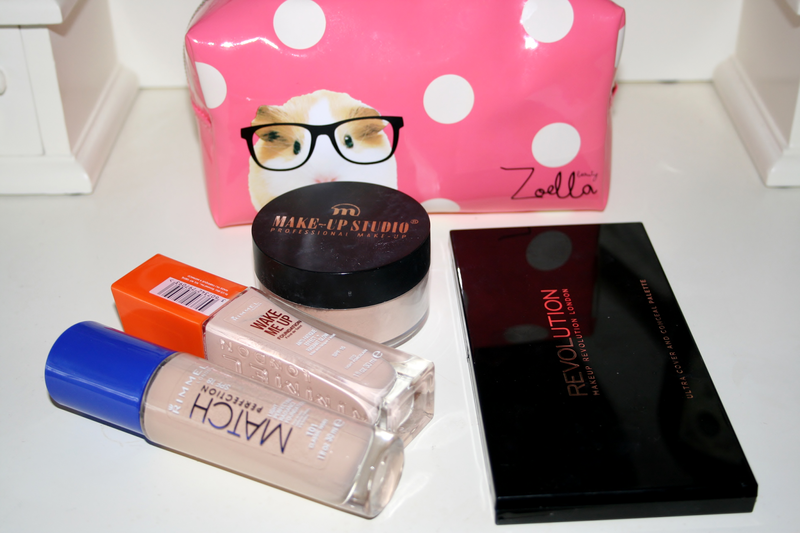 I love Rimmel foundation too! Love the makeup revolution blush palette! The tanya burr lipgloss looks a gorgeous shade! I have the eyebrow kit! It's so good! great products! love that mascara! !